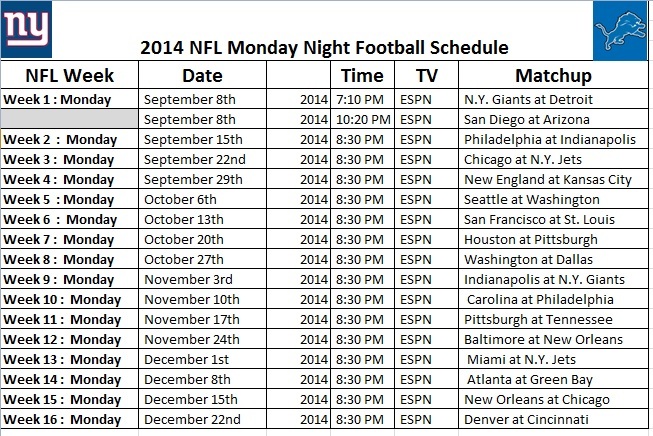 The 2014 Monday Night Football schedule kicks off with a double header on week 1 of the 2014 NFL season. The double header features the New York Giants playing at the Detroit Lions for the early game and the San Diego Chargers traveling to take on the Arizona Cardinals. There are a number of popular matchups set for this season of MNF (Monday Night Football), with the broadcast being covered by ESPN for the 2014 NFL regular season schedule. The final Monday Night Football game is on December 22nd featuring the Denver Broncos traveling to take on the Cincinnati Bengals. The 2014-15 NFL season is finally here. Here’s is the NFL season schedule for 2014-15 in both printable and HTML formats for you to view, download, and print out if you so choose for the Monday Night Football schedule. We provide you with a printable NFL schedule in a printer friendly, PDF version.